Thanks to Thymes for kindly sponsoring this post. All opinions are 100% honest & completely my own. Thank you for supporting the brands that help make Bubby and Bean possible. When I was a little girl, I had this magical book I read incessantly each holiday season called The Sweet Smell of Christmas. Throughout the book, there were opportunities to scratch and sniff (something my fellow children of the '80s will remember) different things related to the season - hot chocolate, candy canes, apple pie, oranges, and a Christmas tree. And while the artificial pine scent of the Christmas tree in the book was nothing even remotely close to the real thing, there was something about even that that triggered the greatest emotional response in me - because the smell of real fir trees so powerfully represented the holidays to me. It still does. To this day, when I smell a Christmas tree, I am instantly transported to my most favorite of holiday experiences from my childhood. It's almost overpowering, but in the best of ways. And it makes sense. Of all the senses, smell is most deeply rooted in memory. When it comes to the holidays and the most vivid memories and positive associations, pine trees are what do it for me. There is nothing better. It has admittedly been a long, long time since I've gotten a real tree for the holiday season. We have a cute, rustic little artificial tree that is filled to the brim with decorations (that we almost never get to removing) and is infinitely easier than getting a real thing each year, but I have always missed that magical holiday smell. 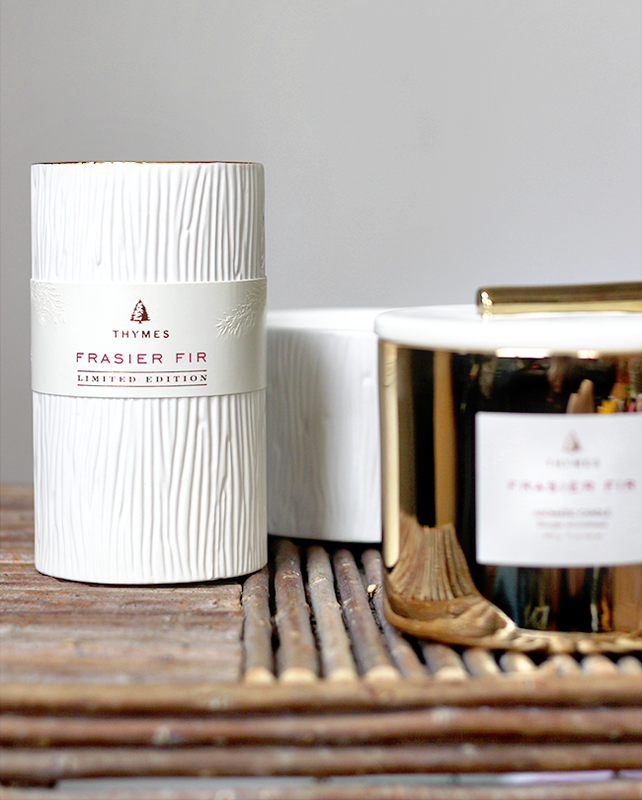 So when I heard about Thymes' new Frasier Fir collection of candles and read about how intensely similar they smelled to fresh cut Christmas trees (Siberian Fir needles, cedar wood, and sandalwood - yes please! 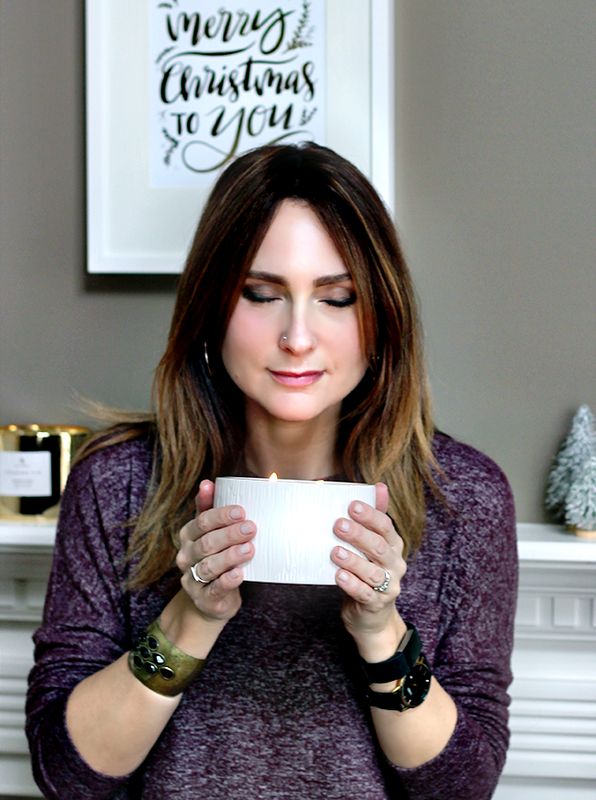 ), I knew they were exactly what I needed to fill my home with that wonderfully warm and comforting holiday scent I missed so much. 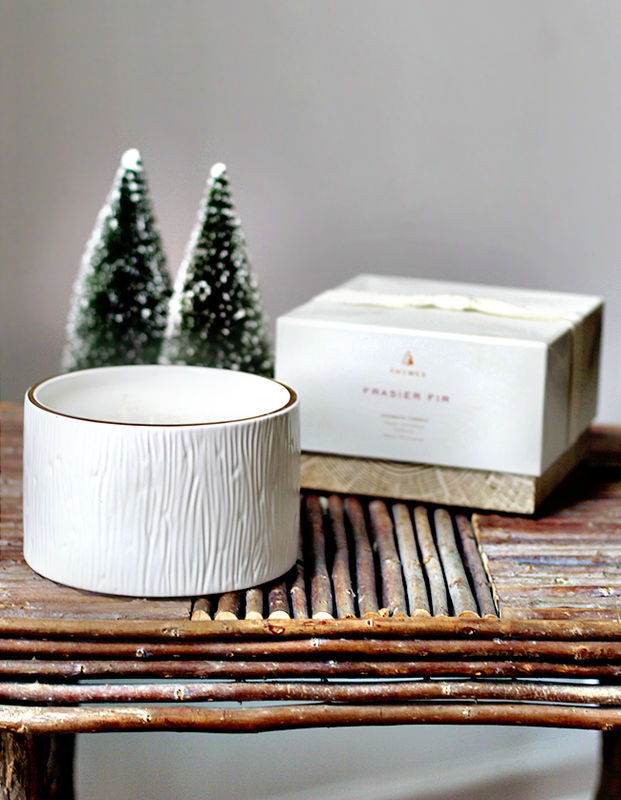 From the five collections available in Thymes' Frasier Fir line (Gilded, Heritage, Statement, Northwoods, and Joyeux), I ended up choosing pieces from Gilded. It felt the most like my personality and design style - the combination of wood grain accents with crisp white ceramic and 24-karat gold trimmings was so perfect. (Whenever I'm asked to describe my style, I say a mix of outdoorsy bohemian and modern minimal. So yeah. Pretty perfect.) When they arrived, I was instantly in love. They're beautifully made and the fragrance is absolutely heavenly. I had so much fun arranging the candles on my mantel while I listened to holiday music and enjoyed that incredible Christmas tree smell. My husband said he was taken back to his childhood as well, and my daughter told me it was "the best smell she'd smelled in her whole life." (All 3.5 years of it.) My designer mom told me she was "smitten" with the simple, modern style of the pieces I chose from the Gilded collection. 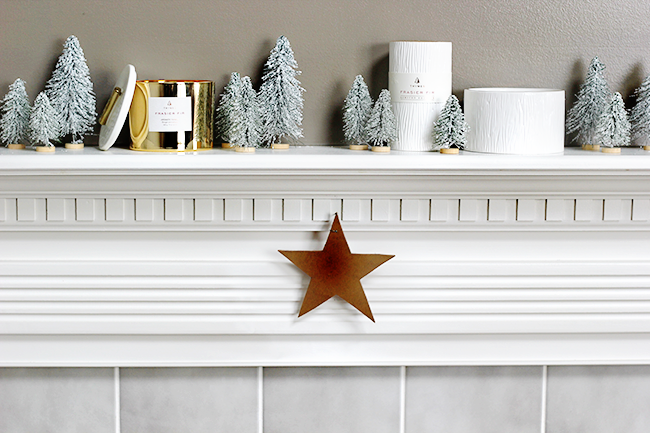 I have genuinely had more compliments on my mantel already this year than in the last several combined. These candles are the real deal you guys. So great. 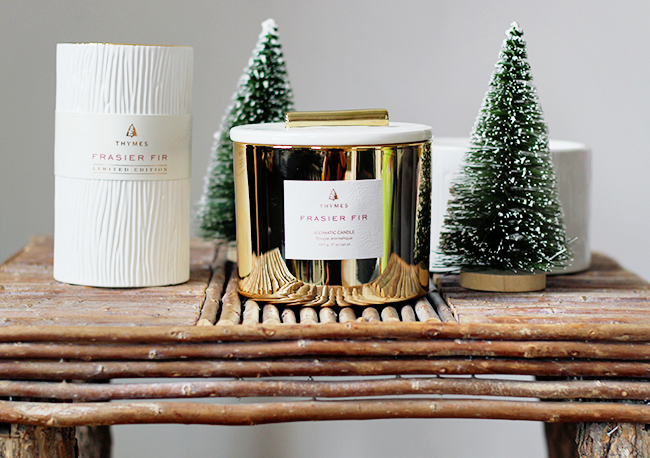 Creating special memories for my kids is important to me too, and I love that even without a fresh tree in our home this year, they'll be able to associate the smell of one with the holiday season because of the beautiful pieces from our Frasier Fir collection. 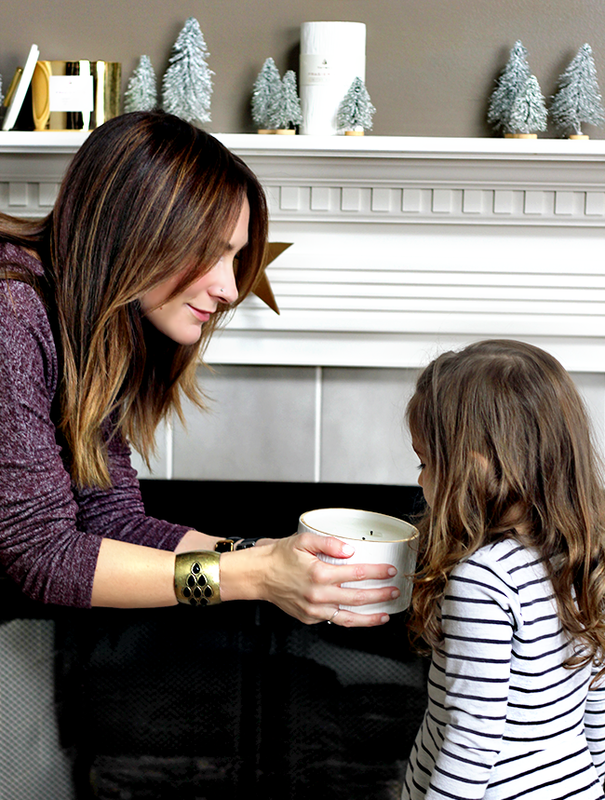 What are you favorite scents of the season? 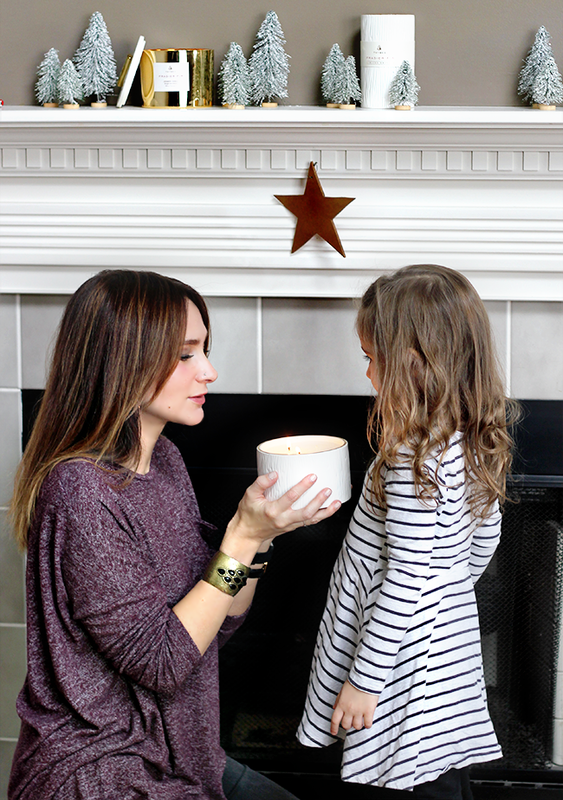 What smells trigger holiday memories from your childhood? Scent an memory are so powerfully linked. Interestingly, the smells that bring back the best memories of childhood for me are country smells - hay, freshly cut grass and event the more unconventional manure and exhaust from farm equipment. When we were kids, our parents took us to small town Saskatchewan often, to the town where our grandad grew up. He owned his childhood home there and my great aunt, his sister, lived nearby. For me, those are the best scent memories, not the Christmas ones. Although I would much prefer a Christmas-scented candle! My favorite scent! I need one of those candles. I love the rustic and vintage Christmas Decor you chose. The white colors are very elegant and the elements of nature are the best accessories. I'd love to be able to smell the candles in person. Those candles are gorgeous and I completely relate to the smell of pine trees being back Christmas memories! I'm right there with you on the Christmas tree smell. 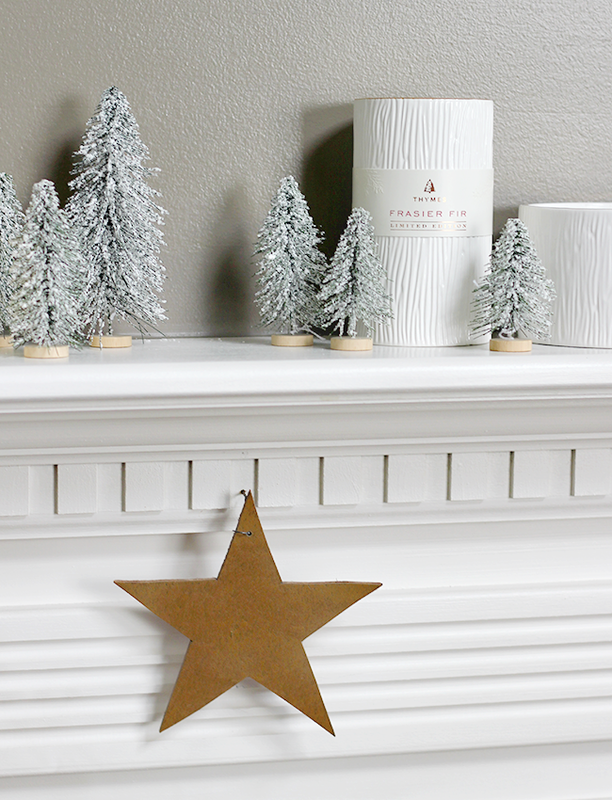 There is nothing like the scent of pine filling a house during the holidays. Simply thinking about it gets me a bit nostalgic! I love scented candles! These make great tabel decor too! 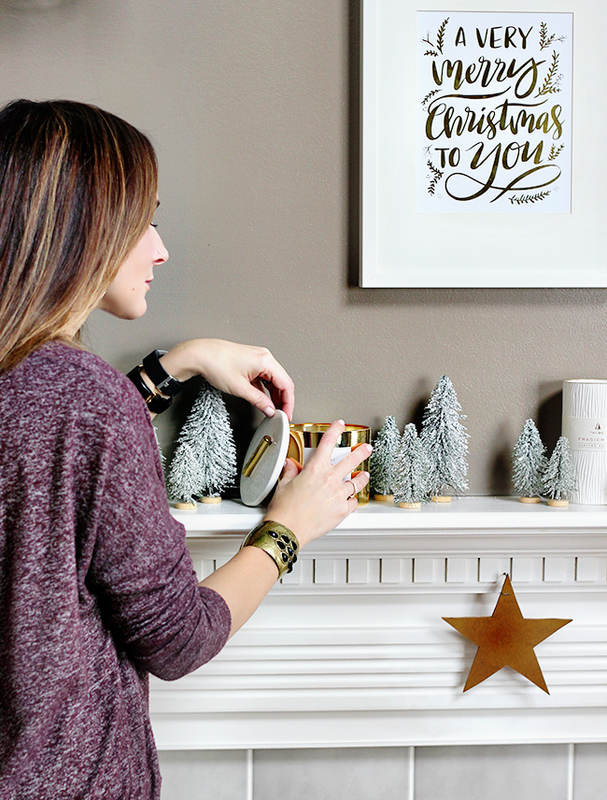 Those candles are the perfect way to make your home smell like a fresh Xmas tree. What a great idea and gift. 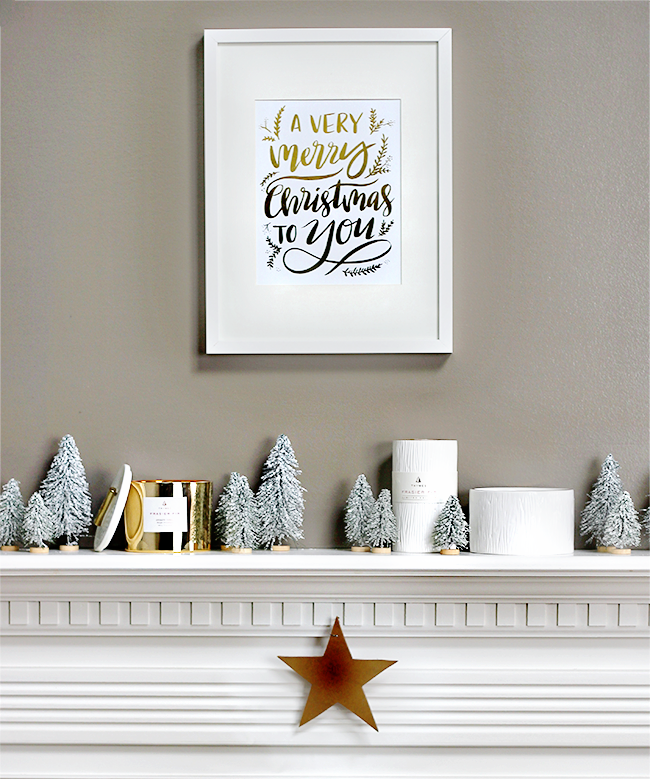 Your home and decor looks so warm and comfy. Great work! I live for holiday candles. Those candles look amazing! And they're so stylish. I love it.